Are you looking for a commercial electrical specialist? With over 15 years of experience, CJ Trent Electrical Services are Brisbane’s specialist providers of high quality commercial electrical services. Our expertise spans everything from routine to complex office fit outs, with electrical design and planning, and testing and compliance assessment. Whether you’re a commercial body corporate or real estate agency, a retail or hospitality business, or a private practice, we can deliver functional and sustainable commercial electrical solutions to keep your business operating the way it should. At CJ Trent Electrical Services, we also understand how important it is to keep the people in your business safe. Your staff, your customers, and your partners should all be protected by the highest electrical safety and compliance standards, which is why our comprehensive suite of services includes emergency lighting, emergency maintenance and repairs, fault finding, and testing and tagging. 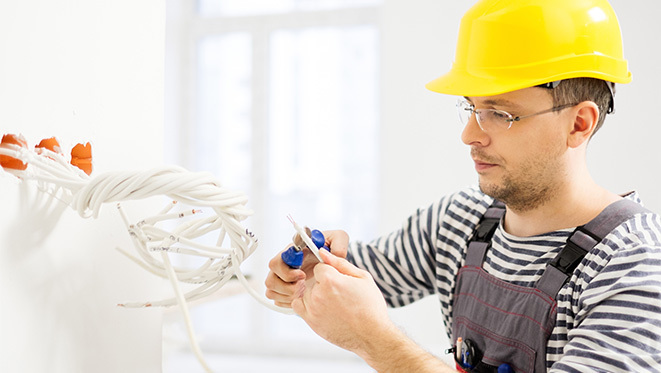 With our reputation for high quality workmanship and innovative electrical solutions, our team of highly skilled and fully licensed electricians will ensure that your business is electrically compliant, functional, and safe. Whether it’s a small- or large-scale project, CJ Trent Electrical Services have the expertise and experience to design, install and maintain the commercial electrical solutions that your business needs for maximum functionality and safety. At CJ Trent Electrical Services, we understand that commercial projects need a collaborative approach to be successful: careful planning is essential to avoiding pitfalls, and to achieving the usability that’s so important for businesses. That’s why we work professionally with builders and developers throughout the consulting, designing, planning, installation and certification stages of your project, seamlessly integrating your commercial electrical services with your other trade work at every stage. Commercial lighting design and installation: including energy-efficient ambient lighting, essential task lighting, and accent lighting for businesses relying on ambience for a professional edge in their competitive market. Data and communications design and installation: including phone and internet points, security systems, and audiovisual solutions—the right number, and in the right places to meet the functional needs of your business’s operations. Emergency services and maintenance: including emergency lighting, emergency fault finding and repairs, scheduled maintenance and auditing, and testing and tagging for compliance with legislative and industry safety standards. At CJ Trent Electrical Services, we understand commercial businesses, and we have the solutions you need, whether you’re looking for electrical compliance, maintenance, or ambience. Contact us at any time to discuss how we can help you complete your project to the highest standard—without the fuss. Emergency lighting is now mandatory in most building codes for commercial buildings, whether they’re new, old, or renovated. Whether or not it’s your legal obligation, CJ Trent Electrical Services will always recommend the installation and regular testing of emergency lighting in your commercial space, to provide critical visibility of hallways, stairs and exits for your occupants in periods of power failure or outages. Exit lights: which indicate in power failures where the nearest exits are, and are an essential component of the fire safety requirements for commercial buildings. Maintained emergency lights: which are on all the time, usually in buildings that are occupied all the time. Non-maintained emergency lights: which only turn on in the event of power outage, usually in buildings that are only periodically occupied. Sustained emergency lights: where the light units are connected both to the main power supply, and a battery supply for operation in the event of power outage. At CJ Trent Electrical Services, we’ll help you figure out which options are the best for your business, and deliver emergency lighting design solutions to ensure that the most important areas in your space—exit doors, fire safety equipment, emergency stairwells and emergency call points—are well-lit and prepared for emergency situations. Our fully qualified professionals can also schedule regular 6 monthly testing for you, to ensure that your emergency lighting remains safe and operational, and to ensure that your building is compliant with building codes and legislation. Fault finding: including emergency services for power outage, short circuits, open circuits and earth faults. Testing and tagging: essential identification and management of potentially hazardous equipment, including power tools, kitchen appliances, cleaning equipment, and electronic devices. Safety system services: installation, maintenance and scheduled auditing of circuit breakers, safety switches and surge protectors, emergency lighting, security systems and smoke alarms. Globe and lamp replacements: including supplying, installation and emergency replacement of globes and lamps, and responsible recycling and disposal of expired globes. Energy efficiency auditing: ensuring your business’s sustainability and environmental compliance—and saving you money—through tariff analysis, energy-efficient technology, and tailor-made action and management plans. We also offer scheduled preventative electrical maintenance, to help you avoid hazards and failures in the future. At CJ Trent Electrical Services, we conform to Australian standards, legislative guidelines, and industry best practices, which recommend 6 monthly testing of commercial electrical systems in order to achieve compliance. Contact our friendly staff at any time to arrange regular audits and testing to ensure that your business remains operationally compliant, and safe for everyone involved. When it comes to commercial electrical design, installation and maintenance, you need an electrician with the broad industry expertise and innovation that will help you achieve the best for your business. For sound advice, thorough planning and design, and the comprehensive suite of services you need now and into the future of your commercial endeavour, contact CJ Trent Electrical Services.